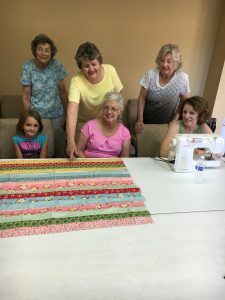 Quilt making is an opportu nity for the women at Christ Worship Center to develop a skill that they, as little girls, probably watched their grandmothers do so very well. It’s also a potentially great form of outreach. If a family in the community is seeking an economical way to stay warm, the ladies are on hand to help anyone learn the skill of quilt making. Among the early American colonists, quilts were an essential item during cold winters. They helped provide snug covers for beds. They also hung over doors and windows to keep out the frost on winter nights. Interested? For more information, call the church at 615-672-2202.